Rustic Pearl, oh how gorgeous you really are. Culinary wise that is. Your subtleties really shine and linger on. You're a great start to the day. No wonder why you're so busy. There are many reasons as to why. Located on convenient and popular Crown Street always helps. There are many reasons you're a Sydney food sensation. First off, you don't feel like you have just walked into any old paradise. It feels like you have walked into a hosts home. Someone's house with that Turkish, artistic theme. You're a great home for any artist or designer. Anyone who likes to create things out of thin air. Turkish coffee is on the menu here too. 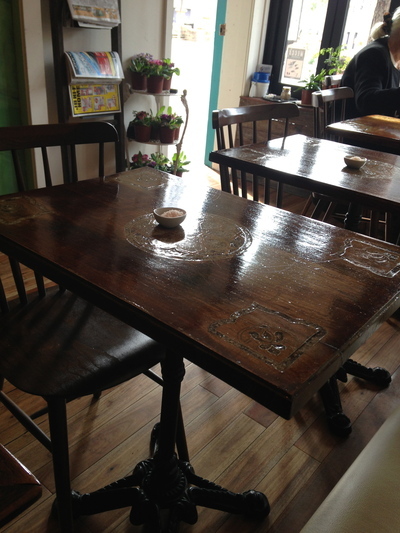 The tables are elegant to begin with. That is only the beginning. Moroccan styled tiling, with taste that will last. Sadly, all good things must come to an end. Was welcomed inside with a friendly disposition. 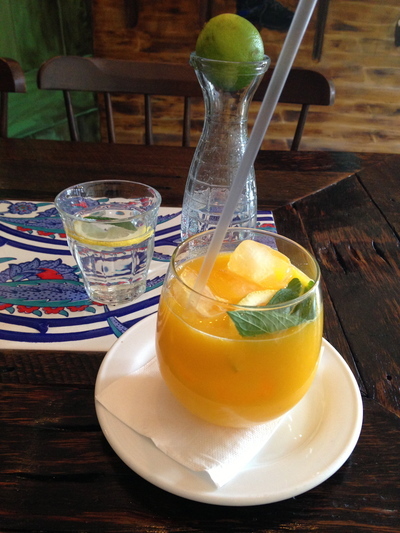 A glass of water with some mint and lemon was a different treat. Amen, those little things that make you say "wow wee." 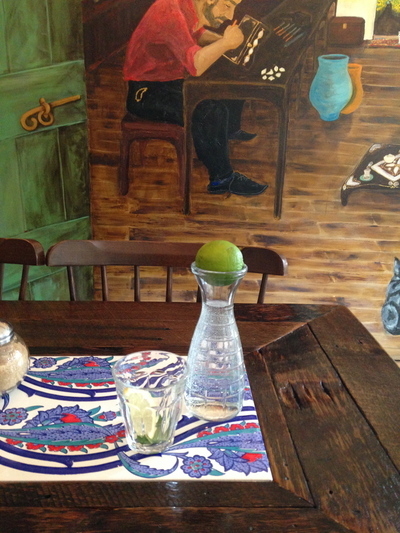 The tiny water jug had a cap that encompassed a full piece of lime. The orange juice ($6.50) was elegantly presented, and more like a beach cocktail. It could have done with a couple less ice cubes, yet this drink was rather refreshing. There was some pulp, and the sugar was not intense. Naturally well presented with a dash of mint. Worth it once in a while. 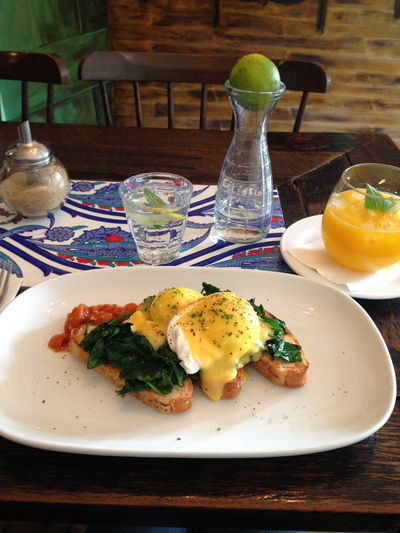 Oh yes, especially with the eggs florentine ($16) with spinach and tomato relish. Lovely herbs combine, with beautifully poached organic eggs. Definitely good food for the soul. That with arts, plants, babushka dolls and other treats. Fast paced Sydney, slow down here. 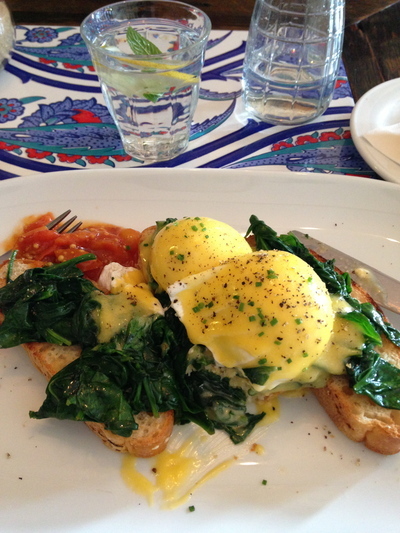 The eggs florentine could have done with a little more spinach. It felt a little weird to have some cold tomato relish (at fridge temperature) on the side with a hot dish, yet the flavours were intense. Definitely a memorable breakfast, and rather filling too. Put your lunch off for a little while. During the week, this place is rather busy, and within good reason. However, come to the pearl on weekends, and you'll be lucky if the universe finds you a good table, if one at all. Life is short, and if you're hunting for a good place for a quality breakfast...you can stop looking. Sydney Food Lovers, your wish has been granted. Where: Rustic Pearl, Crown Street Surry Hills. Why: For awesome ambience, and a really filling breakfast. 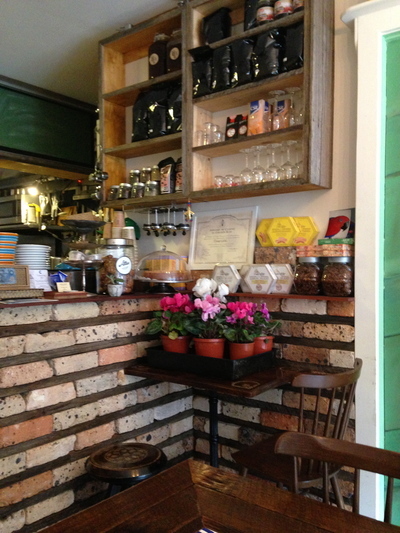 An innovative cafe that is standing out from the crowd. Attention to detail is everything here. When: Breakfast. Friday mornings are ideal. Good for kids: Can be. Better for adults. Take away: For coffee, yes. For other menu items, I'm not too sure. Oh, you can for pieces of Turkish Delights too.